In a quandry about what to give for the bridal shower, anniversary, wedding, birthday, Christmas, or any occasion? Your answer is CAJUN STITCHERY, an embroidery company located in Pensacola, FL. We embroider on ready made items. Our personal service can help you design that perfect, personalized gift. We embroider logos, too. Scroll down the right hand column for our complete price list. As I thought, it took longer to make the mastectomy pillows than it did to make 200 port cushions. 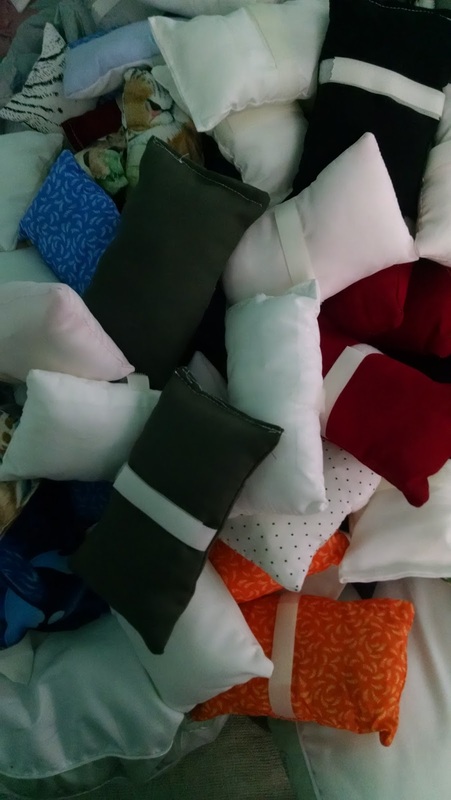 In fact, the second hospital picked up their port cushions as we were finishing the mastectomy pillows for the first hospital. 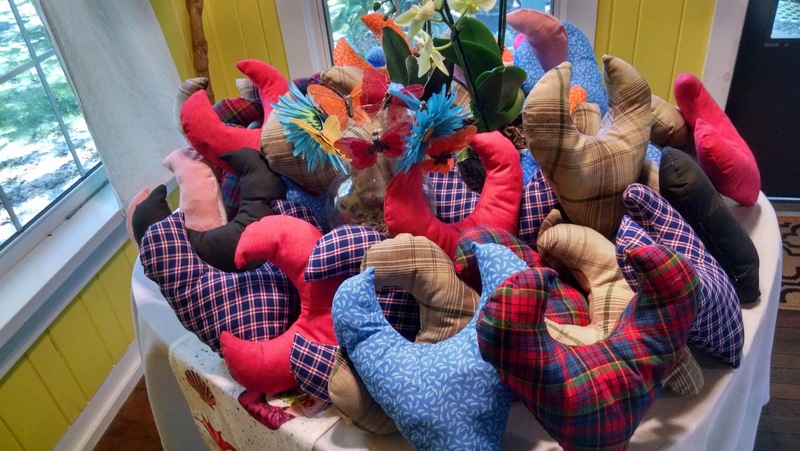 She took one of the mastectomy pillows with her to see if there was a need for these with her patients. She told me she would let me know if they want some. 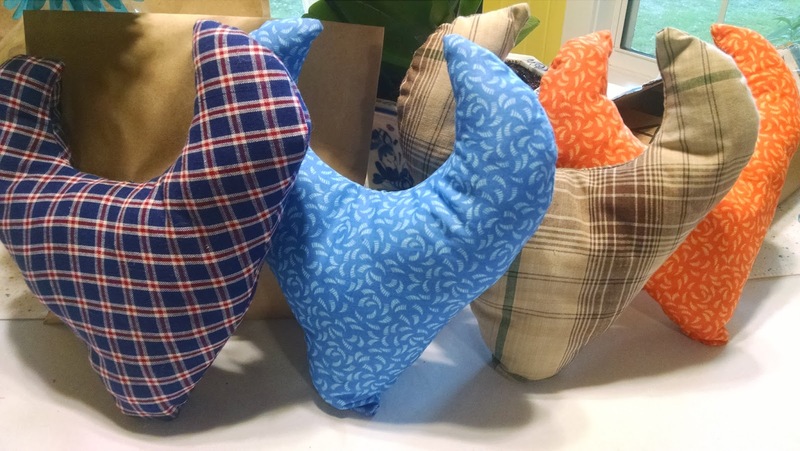 The first hospital picked up their mastectomy pillows and could not stop talking about how much their patients appreciated the port cushions. Apparently no one there had heard of such a thing but they certainly love them. 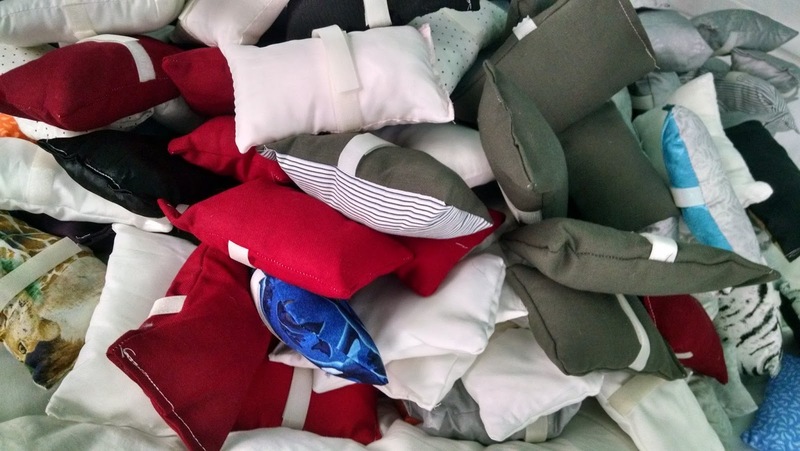 I have a feeling we will be making more port cushions in the future. That is fine because I now have a variety of 5/8" Velcro in various fun colors. We have not really decided on our next project at this time. We've asked the hospitals if there is a project that they would want us to do, but neither hospital could think of anything. In the meantime, I've been thinking about making a simple red, white and blue, patriotic patchwork type throw blanket. So far, I've been going through scraps separating out my red, white, and blue fabric. More on this project later. Step 1: Make the pattern. We made one from cardboard construction paper for 1/2 of the pattern to be placed on the fold. Cut 2 of these. We also made one full pattern out of cardboard. 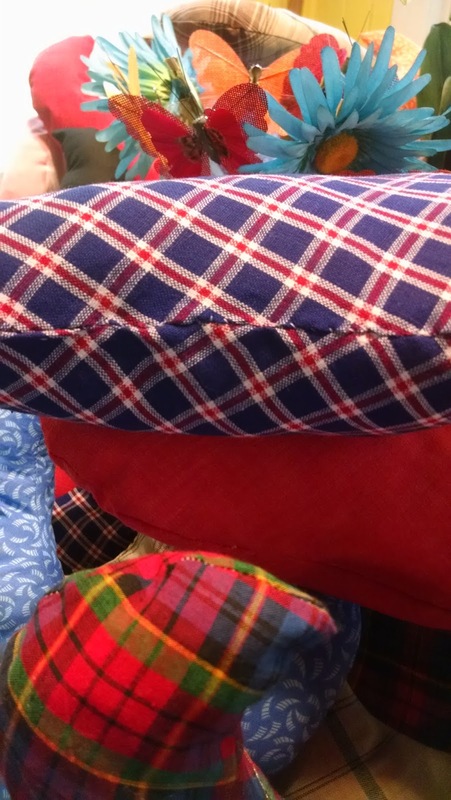 Both patterns were used. It really depended on your fabric as to which was best to use. Step 2: We cut out 2 pieces, back and front, of the pillow, pinning them together as we went. Step 3: We serged and sewed around each 2 pieces of the pillow leaving a good 2" to 4" opening on the side. 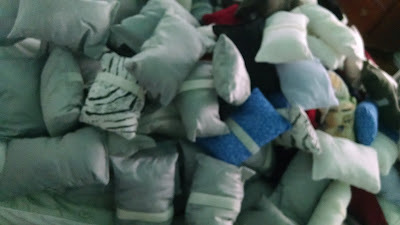 Step 4: We stuffed each pillow with cotton fiber. We did not stuff to capacity. 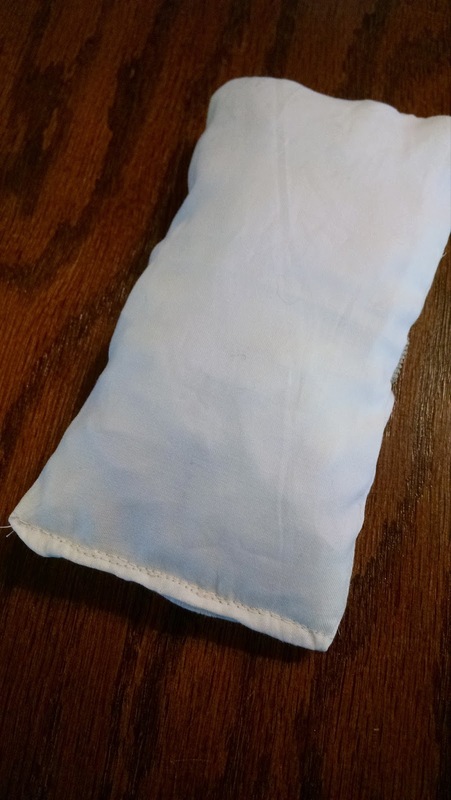 Since the women using these pillows will have surgical incisions which are trying to heal, we did not want the pillow to cause the arm to be lifted too high. Step 5: We sewed the opening closed. Some were sewn by hand and others on the sewing machine. 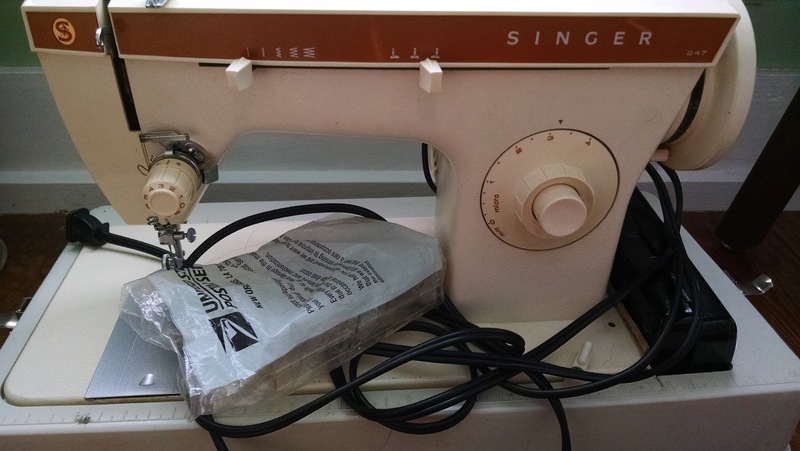 Many years, no, I guess that's decades, ago I was into crafting and sewing. After awhile I had made all of the clothing and house stuff that this little family could use. After another while no one wanted any more handmade gifts. Slowly, I put my sewing machine aside for repair purposes and didn't pick it back up for a long time. After another while all of the scraps and material were either thrown out or given away. Once the internet became available, I found how to repair my machine and began sewing once again. The material and scraps began accumulating. 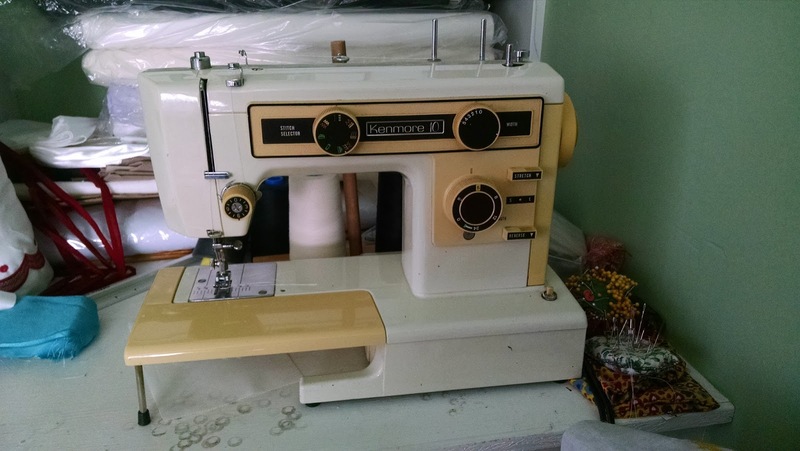 After several years I discovered embroidery machines and eventually opened my embroidery shop, Cajun Stitchery. With Cajun Stitchery gaining in popularity and business doing fine, more and more scraps and fabric were accumulated. My husband began politely commenting that perhaps I should throw some of these scraps away. Over the past years, I truly have been trying to cull the herd of scraps but this is very hard to do. Yes, I'm a fabric addict. One of my absolute favorite websites is Pinterest. 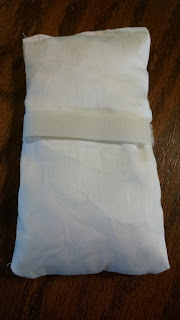 One day, several weeks ago, I ran across some sewing projects for "charity sewing." It piqued my interest and I began looking at pictures and reading articles. I contacted a few friends and we decided to do some charity sewing as a summer project this year, each Saturday. 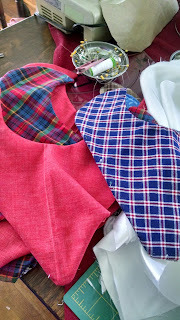 I am offering up my scraps and fabric stash. After contacting a couple of our local hospitals to make sure our items were wanted we began our project. These adorable little pillows were easy to make and I was able to go through just about all of my scraps to make them. The hospitals were thrilled and so were we. Not to mention my husband is 100% behind this project. This project is going to take longer than one day. Our goal is for each hospital to receive 50 of these pillows. This project requires larger pieces of fabric, a 12" x 12" pattern. We broke into the larger pieces of fabric for this project. 1. 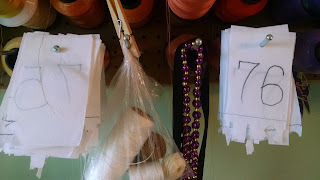 If you are sewing 100, 50 or whatever number of items, make number tabs to keep track of how many you have done. When we were working on the little port cushions, every half hour or hour someone would say, "how many do we have now?" Invariably, the rest of us would say, "I forgot." We would then re-count the items. Save yourself some time and create number tabs of some sort. 2. There are four of us in our group. 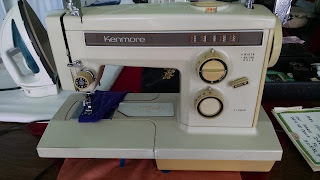 I usually keep my sewing machine and my serger out but took out two additional machines to accommodate all 4 of us. It was a good move because I could check and make sure all of the machines were in good working order. 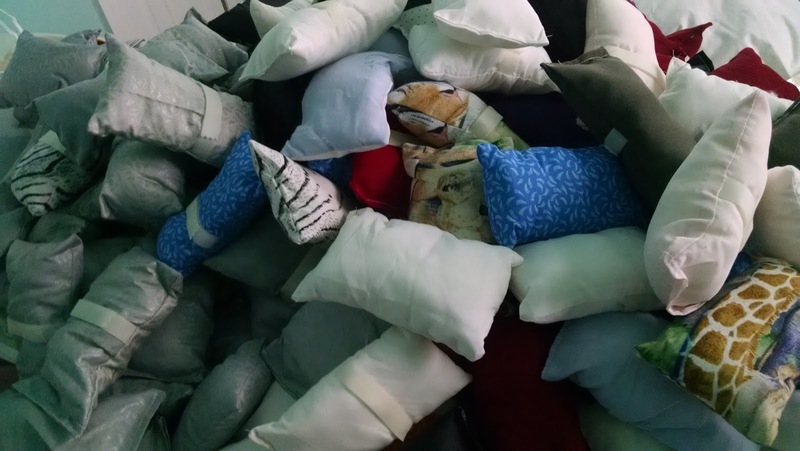 However, we ended up deciding on an assembly line to make the port cushions and one of the machines was not needed at all. 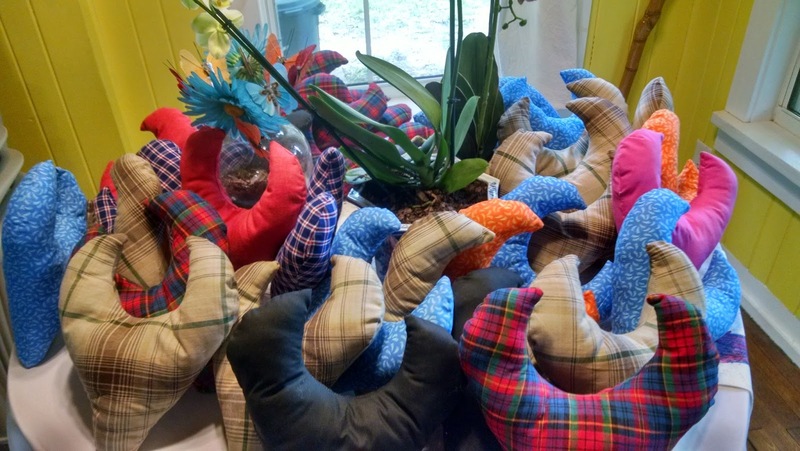 Again, with the mastectomy pillow, we are using an assembly line to do the project. 3. 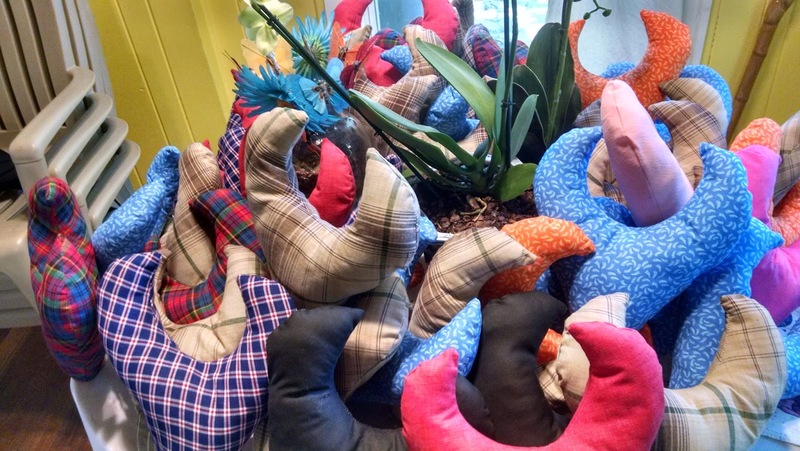 With the port cushion project we used woven fabric and set aside all of the knit fabric and knit scraps. 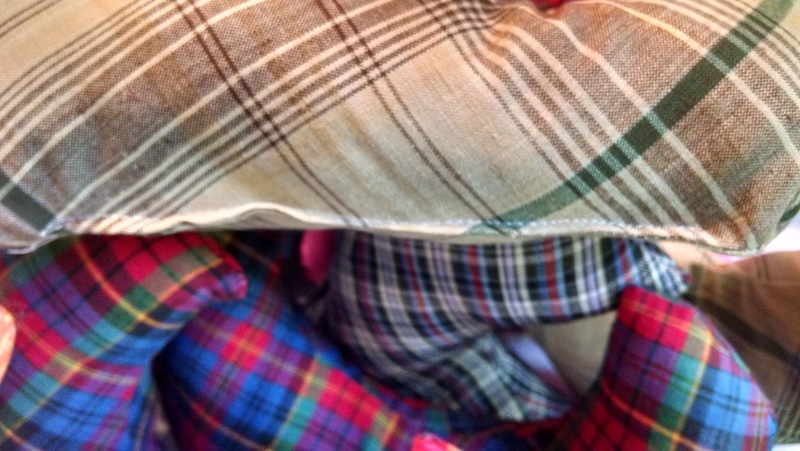 With the mastectomy pillows, we are not only using just woven fabric but also decided we only want lightweight, cotton type fabric. I had several yards of flannel and lots of satin but we decided since these pillows are used under the arm pit and near an incision we wanted to use only fabric that we felt could breath and not harbor bacteria as much as heavier, denser fabric. 4. The port cushion project went through a lot of my scrap fabric and I was able to toss smaller pieces of scrap without too much heartache. 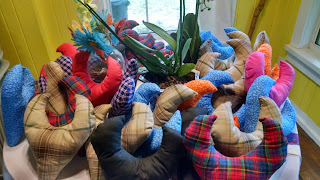 However, making the mastectomy pillows and using the larger pieces of fabric created, you guessed it, more scrap fabric. It was a real "DUH" moment for me. Cajun Stitchery is a home embroidery business that does embroidery on ready made items. TO ORDER from Cajun Stitchery please email or give us a call. All orders subject to Florida Sales Tax and/or shipping. All Orders Received after Noon (12pm) Central Time will enter our schedule the following day. Rush charges of 25% may apply to any order if delivery is requested less than 3 working days from approval of art. Production Schedule: 10-15 working days upon receipt of Art, Merchandise & Approval. Digitizing: Prices vary based on stitch count and complexity. When sending in art, please email the highest quality graphic, preferably vector, but crisp, clear jpg files are acceptable. If you take advantage of our stock embroidery designs, and order more than 12 pieces, there is no set up charge. If under 12 pieces there will be a $10.00 set up charge. When sending in an embroidery design, please email a .dst file (contact our office for other acceptable file extensions). 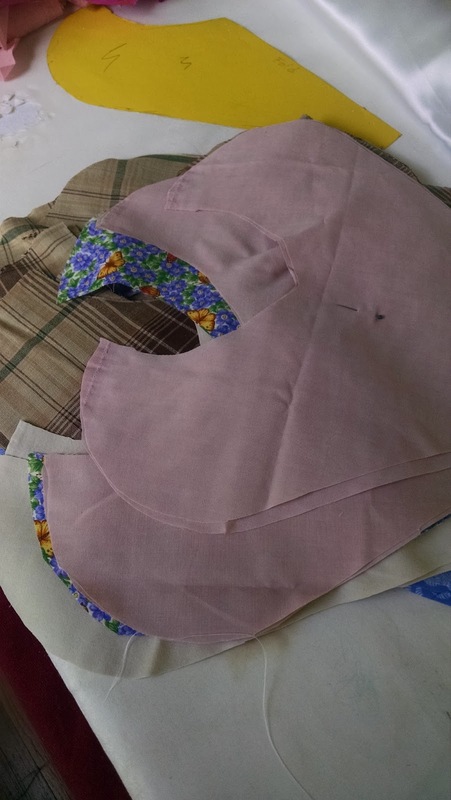 · Situations where Cajun Stitchery would be required to take an item partially apart in order to stitch the design, i.e., jackets with linings when the customer does not want the stitching through the lining, and similar instances. · Minimum cost of an embroidered tradeshow/display tablecloth is $300. Tablecloth price is determined by the art costs, digitizing cost, complexity of the design, stitch count, set up cost, cost of item and number of hoopings required. A hold harmless agreement MUST be signed before Cajun Stitchery will accept the project. The hold harmless agreement is necessary because of the Stuff Happens Theory. If the machine malfunctions or some other unexpected mishap occurs, Cajun Stitchery would not be able to replace an item purchased by someone else.